Cycling is a great way to get around while keeping fit – but for some it’s more than that.For some it can be a passion that drives them to cross mountains and deserts, or to shave fractions of a second off a lap time.Unlike jogging, cycling requires a little bit of an investment in order to get started – and for beginners it can be difficult to know where to begin.Let’s run through a checklist of the items you’ll need to get pedalling – along with a few extra ones that will make things that little bit easier and more comfortable along the way. In order to get cycling, you’ll need a bike.Unfortunately, selecting exactly which bike might prove a challenge – particular if you enter the shop without the slightest inkling of what you’re looking for.Fortunately, most cycling shops come with knowledgeable and helpful staff who’ll be able to point you in the right direction. To being with, you’ll want to spend no more than a few hundred pounds – just in case you decide that cycling isn’t for you.Once you’re convinced, however, you’ll want to invest in the future – a thousand pounds or more will get you a machine that’ll last long into the future. High-end bicycles can be fitted with separately-sold shoes and pedals.These will allow you to tailor the experience to your liking.You’ll also be able to make minor upgrades to your bicycle without getting rid of the whole thing. The best are those which clip into one another, thereby ensuring that you’re able to not only push the pedals down, but pull them up, and that you’re able to do so as effectively and efficiently as possible. Many shops will offer bulk-buy discounts for matching packages of shoes and pedals, so keep an eye out for bargains. The most essential item for a cyclist is a helmet.Without one, you simply won’t be able to cycle safely – or legally.Get one that’s lightweight, and comes with holes that’ll allow your scalp to breathe.If you’re going to be spending many thousands of pounds on a bicycle, then it makes little sense to skimp on the safety equipment.All cycling helmets must conform to certain safety standards – but with the more expensive ones, you’ll be able to meet those standards while maintaining a certain standard of comfort. As well as securing yourself a decent standard of helmet, you’ll want to ensure that you’ve gotten clothing that’s roadworthy.A cycling jersey that’s made from a breathable fabric will allow you to enjoy the experience of riding without turning into a sweating mess while you’re doing it. 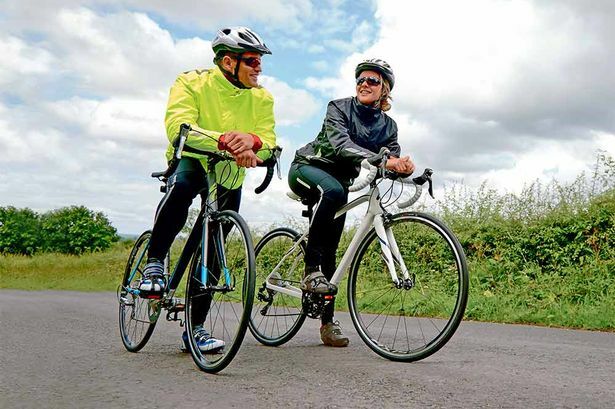 You’ll also need to ensure that your shorts are suitable.Again, comfort is key – you’ll want to keep friction around your crotch to a minimum, as this is the area where the pedalling action can cause the greatest potential discomfort.Ideally, cycling clothing should be tight enough to cut down on wind resistance at high speeds – but it should also be loose-fitting enough to maintain comfort.The best cycling clothing should provide the best of both worlds. You’ll want to be able to perform on-the spot repairs in the event that your bike should break down.You’ll therefore need a selection of tools in a kit that you can take with you.Again, if you buy this together with the other items you’ll need, you’re more likely to secure yourself a discount. While you’re out all day on your bike, you’ll be working up a sweat.In order to avoid the danger of dehydration, you’ll want to keep a water bottle attached to your bike.All decent bikes will come with a place to attach a water bottle – so be sure that you’ve got one. In order to transport your bike from place to place, you’ll need a means of securing it to your car.You can get racks which attach either to the rear or roof of your car which serve just this purpose.If you’re storing your bicycle in your boot, however, you’ll need a means of protecting it against dirt – and a boot liner provides exactly such a means.Boot liners come in several different shapes and sizes – you’ll want to opt for one that’s made to measure for your chosen model of vehicle.You can get Audi, BMW and Mercedes boot liners from specialist retailers – along with liners to fit a range of other models.